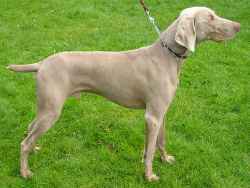 Named after the city of Weimar, the Weimaraner is a silver-gray breed of dog developed originally both for tracking large game and as a gun dog. The name comes from the Grand Duke of Weimar, Charles August, whose court enjoyed hunting. Today's breed standards developed in the 1800s, although it has existed since at least the 1600s in a similar form. Its short, smooth gray coat and its usually gray eyes give it a regal appearance different from any other breed. There is a long-haired variety that is not as commonly known.